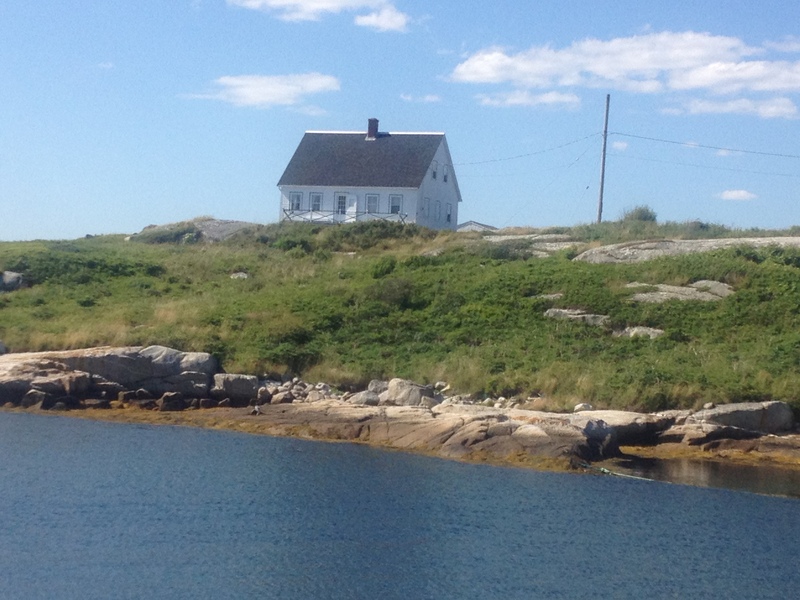 The Lighthouse Route is a meandering and very scenic drive along Nova Scotia’s South Shore. 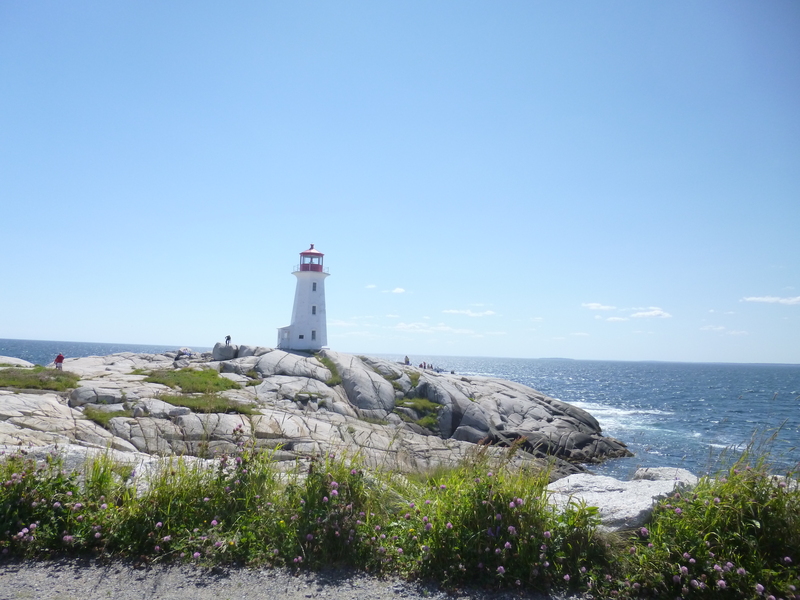 The Shore claims to have over twenty lighthouses – most of which were declared “surplus” by the Canadian Coast Guard in 2010 when lightkeeping on all of Canada’s coastlines was largely and notoriously automated. As a result many of the lighthouses are decorative. 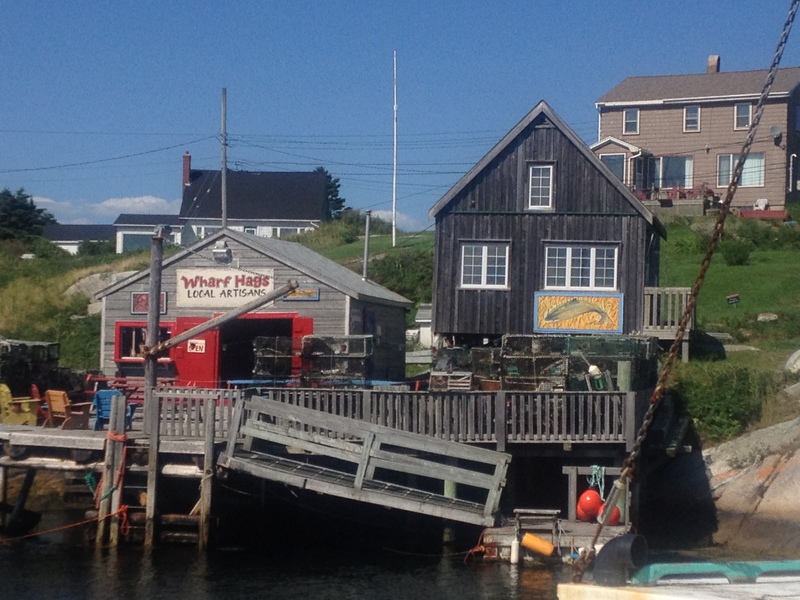 The drive is a journey back in time through tiny villages like Mahone Bay, Chester and Hubbards, their streets lined with small clapboard houses with strings of brilliant laundry flapping in the sun in back yards. The most prominent building in most communities is invariably the church – or in the case of tiny Mahone Bay five churches. It seems like a place of simple lives, reminiscent of simpler times and illustrative of the meagre living eked out by those who relied on the sea for their daily bread. 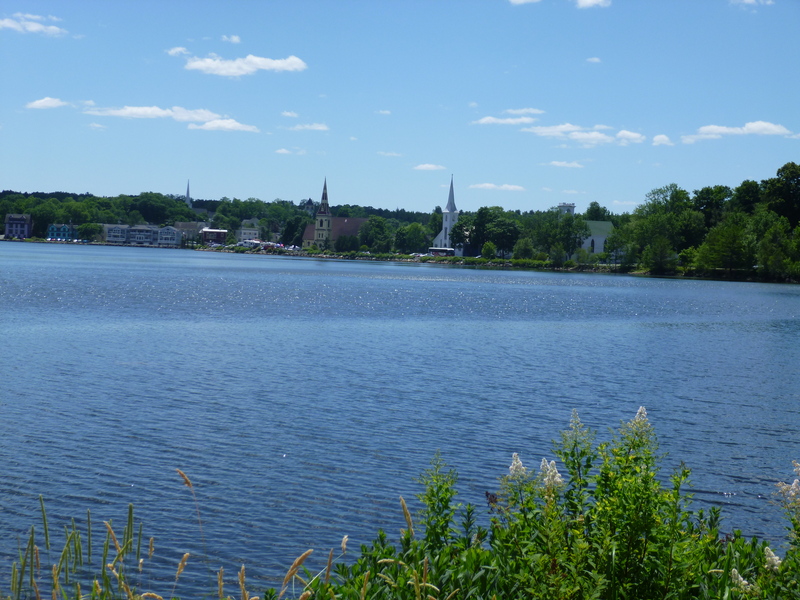 Beautiful and pious Mahone Bay east of Lunenburg. There are no less than five churches in this town of less than a thousand souls. Inviting ‘white ‘ sand beach along Saint Margaret’s Bay on the Lighthouse Route. 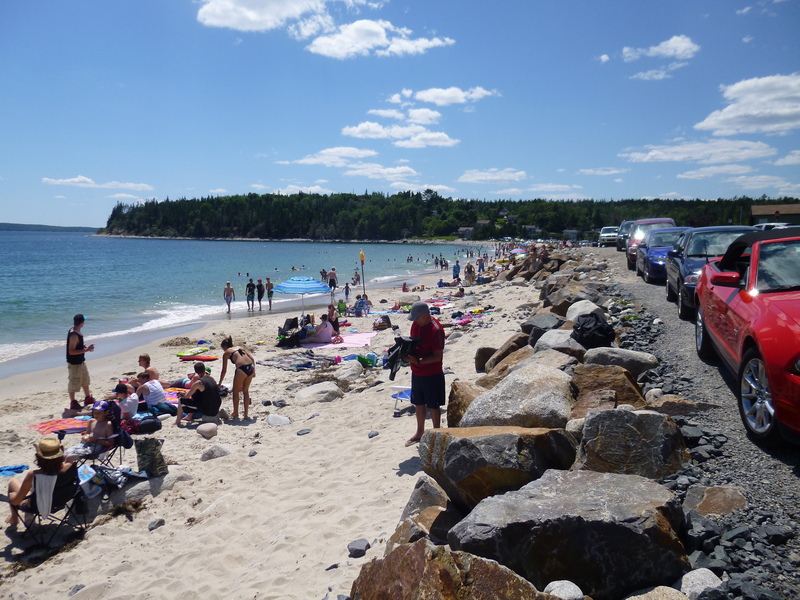 It seemed like the whole town had taken the day off to go to Bayswater Beach. Peggys Cove seems to be a place with an identity problem. Not only is there uncertainty around the origin of the name – is it ‘Peggys’ because that’s the short form for Margaret (and St. Margaret’s Bay is just around the corner) or did it derive from the first recorded name (in 1766) Peggs Harbour? On top of that, somewhere around 1976 Peggy’s Cove lost her apostrophe and officially became Peggys Cove, with Peggys Point and her lighthouse following suit – although most promotional materials and web sites still refer to ‘Peggy’s’ apostrophe included. Regardless of origin or spelling, Peggys Cove is a singularly beautiful place in a part of the world where the turn of every corner takes your breath away. Each of the four major coast lines of Nova Scotia has it’s own unique personality. Cape Breton’s coastline is wild and rugged with towering cliffs carved away by the sea on all sides, the Fundy Shoreline is old, established and somewhat prim with stately homes and streets shaded by spreading trees. The South Shore of Nova Scotia feels distinctly nautical, the Atlantic Ocean having worn away the coastline and reduced much of it to smooth, bare rock with low, windswept vegetation – almost tundra-like. Part of what makes Peggys Cove so stunning is the suddenness of coming upon it. Peggys isn’t so much a cove as a deep fissure in the giant boulders. A line up of cars and tour buses turning off the two lane road onto a gravel driveway suggests that there really is something pretty special here, and as you come over the rise and down toward the sea there it is – an exquisite, deep, glassy harbour protected by a very narrow entrance, guarded by huge sloping rock. And on the point a large and stately lighthouse, radiant white against an electric blue sky. The first time I visited Peggys Cove was on a business trip when I found myself with an hour and a half to kill between flights. I drove like mad out to the Cove, which was almost deserted at that time of year, dashed into the coffee-come-souvenir shop to stay warm and gazed out the window as the Atlantic pounded the lighthouse,and came crashing through the narrow entrance into the tiny cove. It seemed like I was the only person out there on that blustery day, save for the rare permanent resident of Peggys Cove . It was wild and wonderful, and I was sorry to have only a few minutes to enjoy it. This visit was much different, it taking considerable skill to avoid being run down by carloads of sightseers and the massive, brightly painted tour buses that careened down the drive and between the huge boulders that ring the cove. Peggys Point Lighthouse – one of the most recognized lighthouses in the world. In June 2010 the Canadian Coast Guard declared almost all lighthouses in Canada “surplus” – including this one. 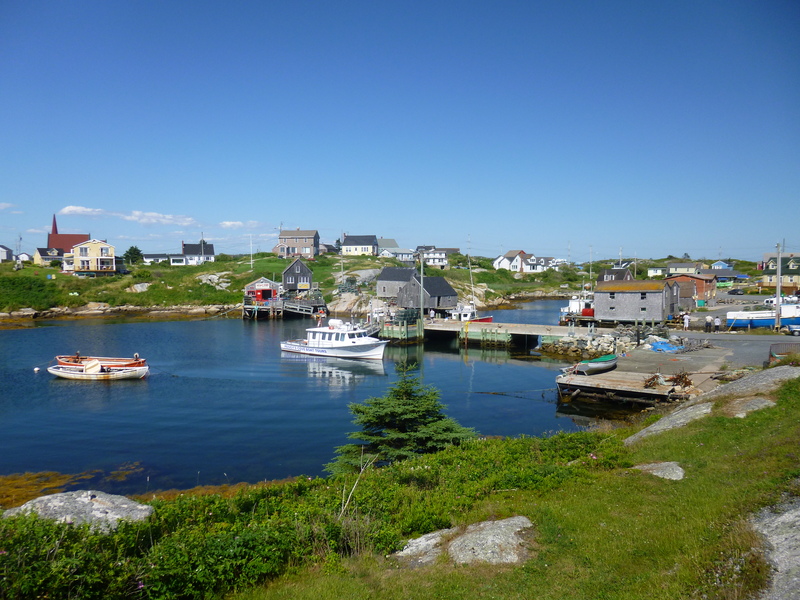 The tiny community at Peggys Cove – Population 38 or 46. It seems to vary. I’m always looking for interesting places to park myself for awhile where I can commune with nature and write to my heart’s content. This looks like a good spot. Wharf Hags “Local Artisans” and my kind of girls. When I do settle here I’ll certainly stop by for a neighbourly cup of coffee. 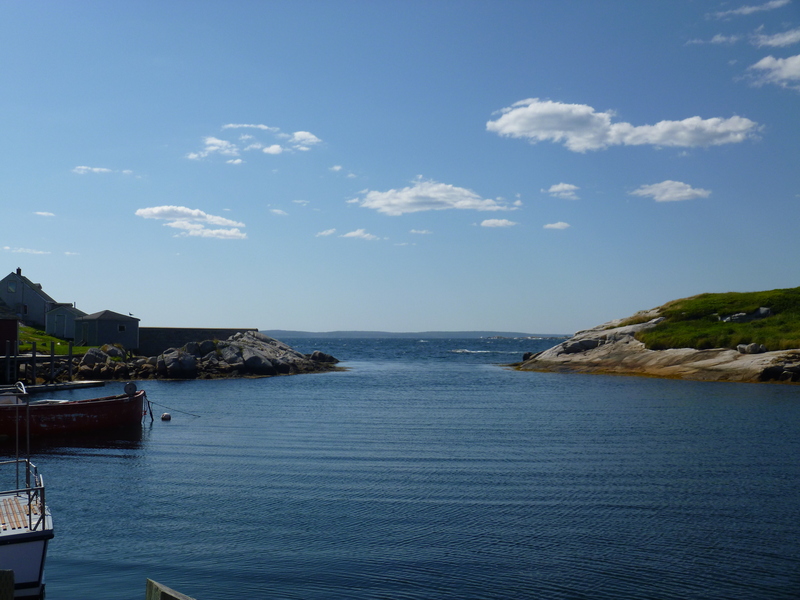 The narrow mouth of Peggys Cove. On September 2, 1998 SwissAir flight 111 en route from New York to Geneva, Switzerland crashed into the Atlantic at the entrance to St. Margaret’s Bay, just around the bend from Peggys Cove. All on board perished. Initial rescue efforts were largely mounted by volunteer Auxilliary Coast Guard units in privately owned fish boats. I wonder how the Coast Guard will ever automate that function. Wreckage washed up along St. Margaret’s Bay and Peggys Cove for weeks. I was standing out on the bare rocks on the ocean-side of the lighthouse, gazing out at the Atlantic, thinking about the aircraft that lies in pieces beneath it and the lives interrupted, when I heard the sigh and wheeze of bagpipes – a sound that almost always moves me to tears. 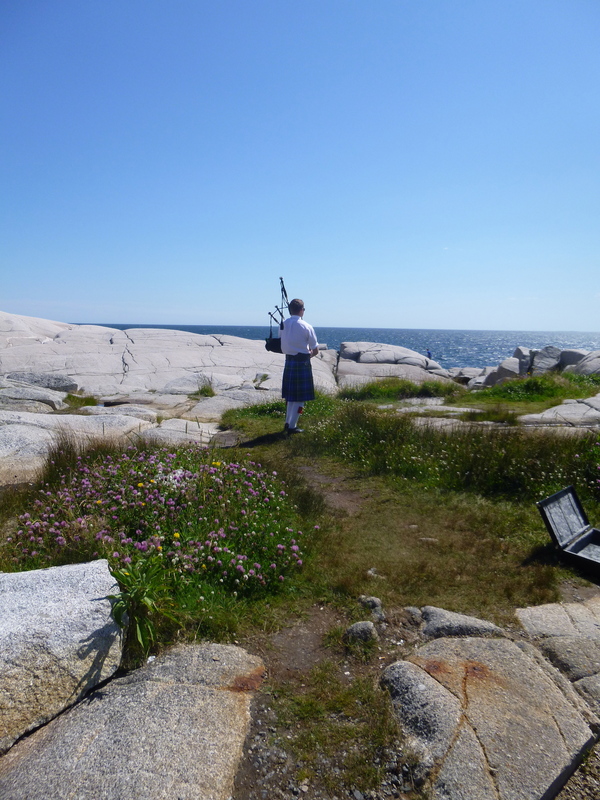 A lone piper had set up on the walkway out to the lighthouse, his instrument case open in front of him so tourists would drop in a coin or a bill to show their appreciation for the impromptu concert. At one point, however he walked away from the path and went to stand almost at the waters edge, playing out to sea in what I am sure was a tribute to those lost on SwissAir 111. 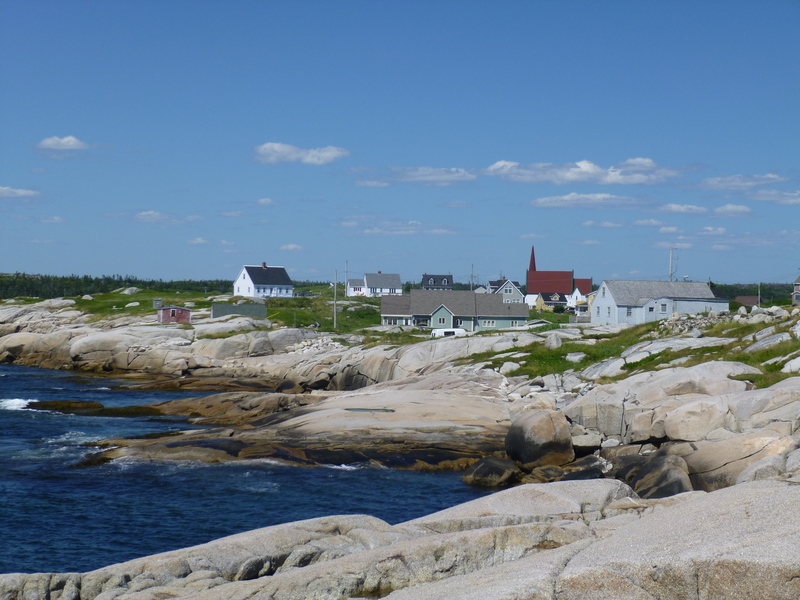 Two memorials provide a place for relatives of the crash to get closer to their loved ones – The Whalesback on a point near Peggys Cove and a more private site at Bayswater Beach Provincial Park. Usually I do not read post on blogs, but I wish to say that this write-up very pressured me to check out and do so! Your writing taste has been amazed me. Thanks, very great post. The loss of so many lives is always so sad. What a wonderful gesture to play to those souls.